SUNGAI PETANI, March 10 (Bernama) -- The Information, Communications and Culture Ministry will be holding information sessions to explain clearly the issue of the Lynas rare earths processing plant, in Kuantan next month. Its minister Datuk Seri Dr Rais Yatim said the people in the Pahang capital need to be briefed properly on the issue because the Opposition was trying to twist the facts about safety concerns regarding the plant. "My ministry is planning huge Komuniti 1Malaysia gatherings in Kuantan in April in the hope that thousands will come to hear the government's side of the story. 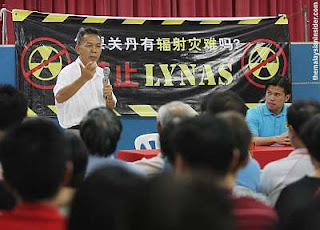 "The briefings at the entrance of the construction site of the Lynas plant (in Gebeng, Kuantan) will be done to assure the people that their safety worries have no basis," he told reporters after attending a 1Malaysia Komuniti programme here Saturday.